Anyone who is serious about BBQ also needs to be serious about meat. That means skipping the mega-mart and heading to a good old-fashioned butcher shop to find the highest quality meats and the best cuts for your recipes. Need a special cut? Have a weird request? Want a suggestion of what to buy and how to cook it? Your butcher is, quite literally, there to help you. 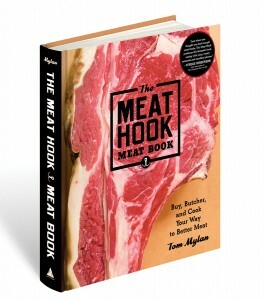 Tom Mylan, co-owner of The Meat Hook in Brooklyn, New York, and author of The Meat Hook Meat Book (Artisan, 2014), offers some expert know-how on getting the most from your butcher shop. The first and most important thing is to find a butcher that you like. A good butcher shop is equal parts marketplace, community center, and neighborhood bar, where regulars shop, gossip, and run into each other. Just as with cars, clothing, and bars, you should find a butcher shop that suits you, feels right, and speaks your language. The more comfortable you are talking to your butcher, the easier it will be to ask questions, get suggestions, and have an all-around better experience buying meat. If you haven’t taken the time to find a butcher that you feel good about, you’re less likely to do the most important thing when it comes to buying meat: actually talking to your butcher. 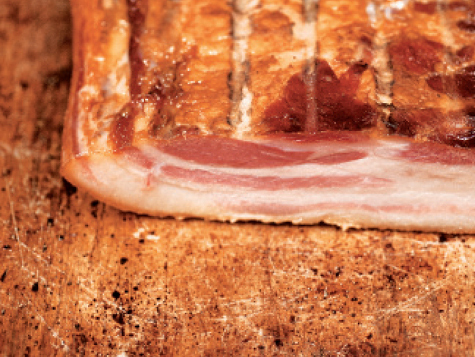 Tell him what you’re thinking about cooking, what you’re interested in (making bacon, perhaps? ), and ask him for advice and suggestions. Chances are good that if you’ve found the right butcher, he’ll be full of ideas for cuts that you’ve never before considered. This is very important. Many butcher shop customers are so full of their own monologue that they don’t listen to their butcher’s words. This is a big mistake! Always remember that all your butcher does is cut and think about meat, all day, 50 hours a week, every week, and has probably been doing so for years or even decades. That is a lot of experience! They’ve likely heard and seen it all, so why not take advantage of that? Butchers have a lot of wisdom to share with you, so make sure your conversation is a two-way street. Unlike just a few years ago, there are now lots of great books out there on every aspect of meat. Every cook and author approaches meat differently, so read as many books as you can to get a fuller understanding of how meat works. Not only will reading widely help you to have a better interaction with your butcher, it will make you a better cook by opening you up to all of the possibilities of what you can do with meat. Knowledge is power. Power, in this case, is better BBQ. Sure, it’s nice to tell your butcher when the cut he sold you turns out amazing, but there is always more to be learned from failure than success. Tell your butcher when something doesn’t end up how you’d hoped, especially when it is a complete disaster. Include as many details as possible about how you handled and cooked the meat so that your butcher can figure out what went wrong and where. If the mistake was made in the cooking, you’ll come away with a whole new understanding of that cut and how to prepare it. And if it turns out to be your butcher’s guidance that led you astray, you might just get some free meat out of deal. It’s a win-win. Despite what glossy magazines and recent newspaper articles may show, being a butcher is not a glamorous job. It’s a lot of hard physical labor and long hours for not that much pay, which means that most butchers do it because they love the work. That said, butchers love it even more when a customer with a time-consuming request or hard-to-find special order brings them a six-pack of beer. Speaking from my side of the counter, that gesture will get you pretty far in most endeavors. Tom Mylan is executive chef and co-owner of The Meat Hook. Opened in 2009, The Meat Hook is a local, sustainable butcher shop housed in Brooklyn Kitchen, New York City’s largest cooking school for home cooks. Tom has contributed recipes and stories to Food & Wine, Gilt Taste, and Gourmet and has appeared on Anthony Bourdain’s No Reservations. Chow.com called him one of the 13 Most Important People in Food (2010), and New York magazine named him one of the “Curators of New Brooklyn.” Mylan’s first book, The Meat Hook Meat Book, is the definitive guide to buying, butchering, and cooking better meat at home.